If you have some free time Thursday August 12 and you just happen to live in the San Francisco Calif. area, we might have a suggestion for a late morning/early afternoon activity. How about donning a costume made from plastic bags and marching from Ghirardelli Square to the Maritime National Historic Park? Well if you attend the “Don’t Feed the Bag Monster” event the opportunity is all yours. 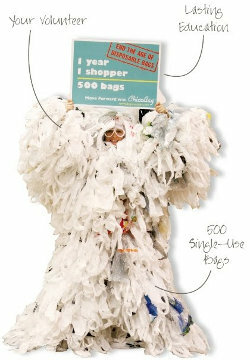 A campaign intended to show support of California Bill AB 1998—that if passed would ban the use of single-use plastic bags—is behind the Bag Monster occasion. The costume, a free reusable bag, snacks and water will be provided at no cost to attendees. Volunteers will first gather at 900 North Point Street at the corner of Beach and Lark at 10 am to change into their fashionable Bag Monster duds. The event itself takes place from 11 am until 2 pm. Keep in mind the event is looking for 100 people, so if you are interested get in on the action early. I know if I lived in the San Francisco area I would be there with bags on. For more information visit the Bag Monster Blog.